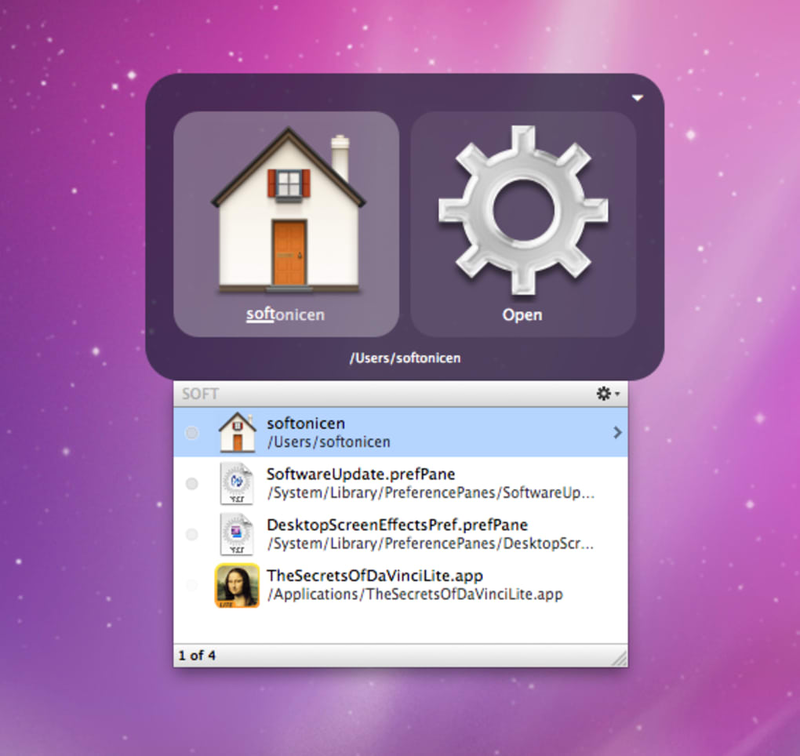 Quicksilver is a handy app and folder launcher has quickly become one of the essential applications on Mac. For those of you not familiar with Quicksilver, it's an application that lets you reach any program, folder or file in a few keystrokes. You don't have to go searching through your files, you don't have to worry about how your folders are arranged. For many, Quicksilver was a godsend in the pre-Spotlight Mac era. Although it's lost some of its importance with the new powerful search and Finder features in Leopard it still remains very much an excellent Mac application. The search function is very quick and powerful and once you've found what you're looking for you can apply a number of actions like simply launching it, emailing or moving. What's more Quicksilver adapts to the file it finds, so if it's a document you'll get to modify or send it, and if it's an email you'll get to email or copy it. Quicksilver users also like the fact that the application learns from what you search to bring up what you search for or use most. Quicksilver wouldn't be what it is without its large library of plugins though. This includes everything from dialing a phone number to interacting with iTunes or image and text manipulation. This means you can really customize the application to work according to your needs. The only downside is the stability issues that Quicksilver seems to have. The application is noted to crash every once in a while. 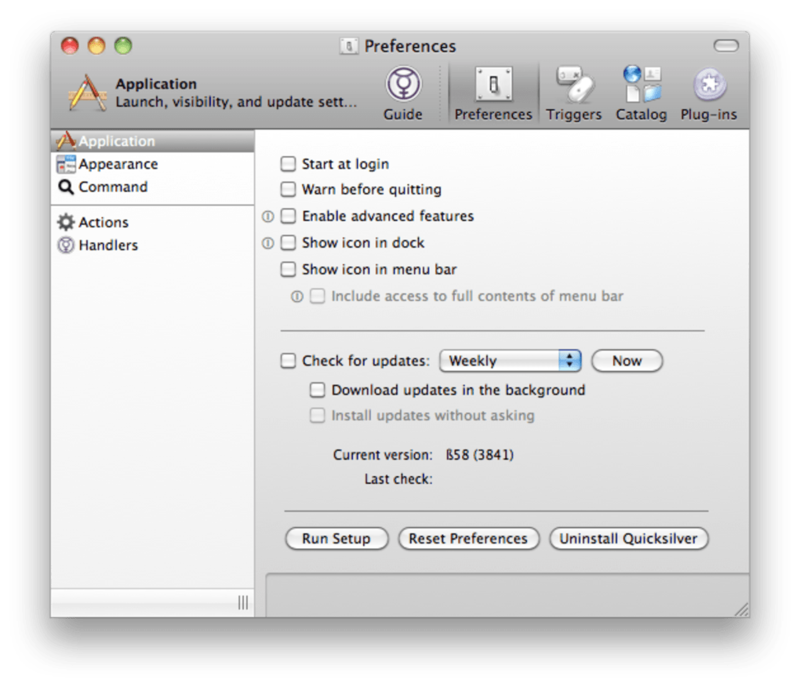 Despite this stability issue, Quicksilver remains an incredibly intuitive and powerful multi-application launcher for Mac. Recommended for productivity geeks. 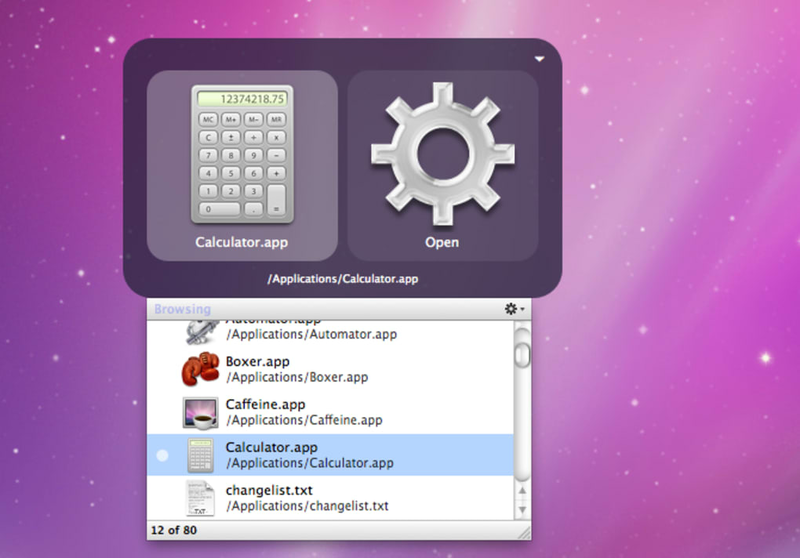 Quicksilver is a unified, extensible interface for working with applications, contacts, music, and other data. 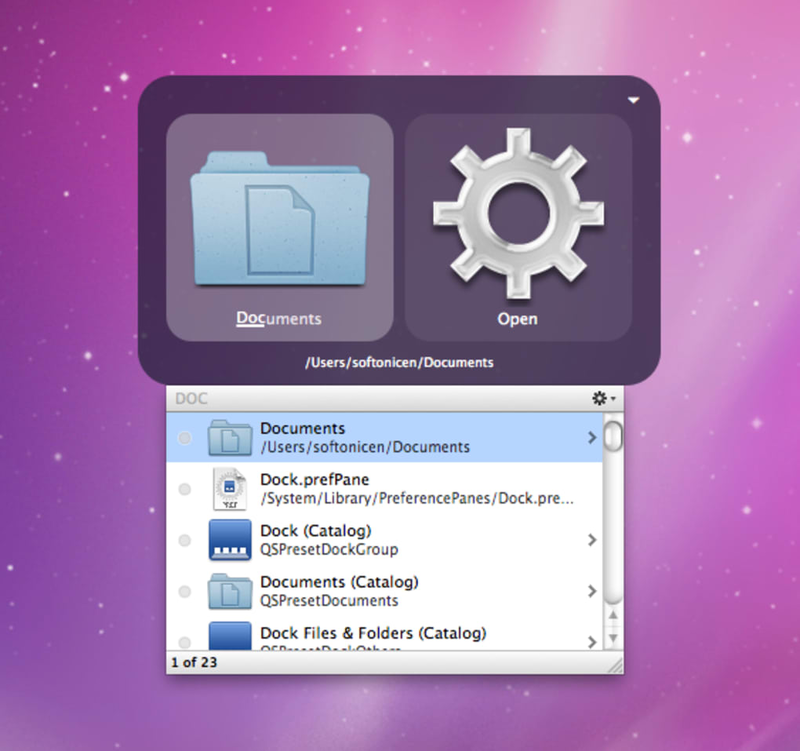 When opened, it will create a catalog of applications and some frequently used folders and documents. Activate it, and you can search for and open anything in its catalog instantly. The search is adaptive, so Quicksilver will recognize which items you are searching for based on previous experience. It also supports abbreviations, so you can type entire words, or just fragments of each. When not in use, Quicksilver vanishes, waiting for the next time you summon it. 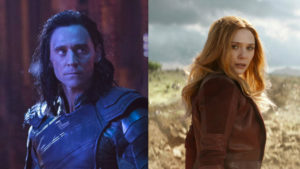 Quicksilver’s greatest strength, however, is not search. Any item you are able to find, drag, or otherwise pull into its universe is endowed with many potential uses. Hitting takes you to the action field, where you can use the same adaptive search to select what you would like to do. Among other things, files can be emailed, copied, compressed. Text can be modified, transmitted between programs, or searched for on the web. Some actions even support an indirect object, so you can send an item to a person, move files to another folder, or open files with a specific application. Quicksilver can be given the ability to understand the data inside of files, allowing you to work with data in new, faster ways. 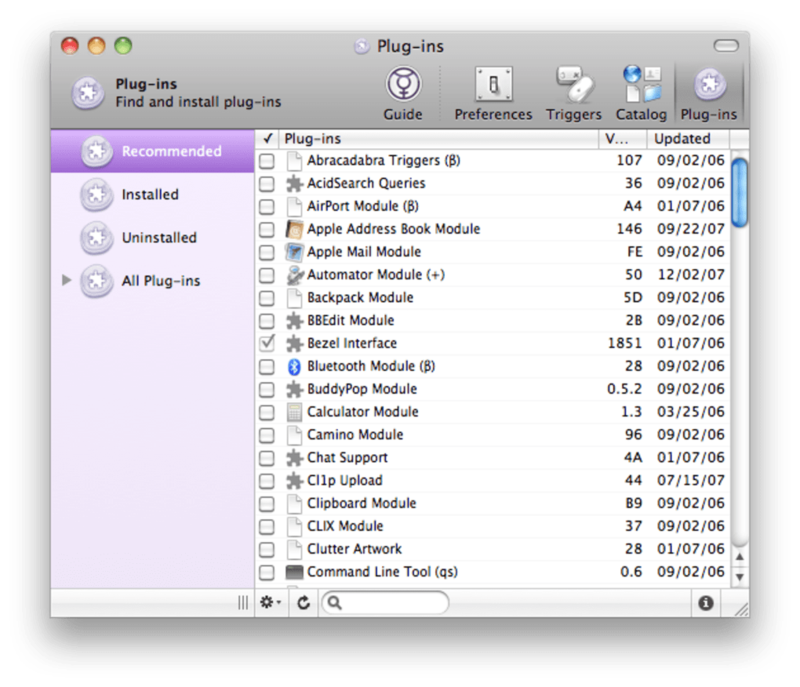 Plug-ins add both new items and new actions, allowing you to run scripts, send instant messages, dial phone numbers, look up words in a dictionary, queue up songs in iTunes party shuffle, and much, much more. Frequently used commands can be bound to triggers, giving you the ability to execute them immediately by hitting a hot key or using the mouse on a corner or edge of the screen. Don't send me marketing email.. Why do I have to agree to accept electronic messages from you? Quicksilver did not install.. Downloaded it. Opened disk image. &quot;Copy to Applications folder?&quot; Yes. Quicksilver nowhere to be found. &quot;Quicksilver wants to make changes. Type in your password.&quot; Did it. Quicksilver disappears. Best control interface ever!. 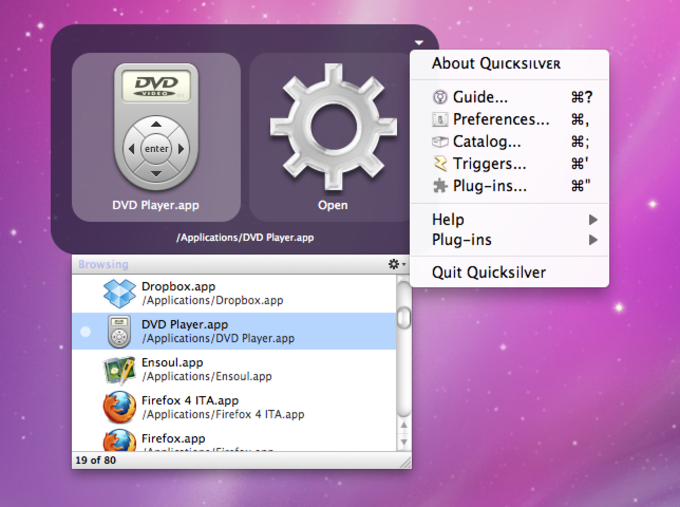 Quicksilver defines the way I use my Mac. I use it to launch applications and scripts, open files, switch network locations, send emails, control iTunes, and far more, all with no conscious effort, and in a fraction of a second. Latest version: now found at qsapp.com (at github choose the &quot;package&quot; download) or at blacktree.com. 10.6 Stability problems: due to old plug-ins, I think—go to ~/Library/Application Support/Quicksilver/PlugIns and try removing some before launching QS. Can re-add them one by one, see what crashes QS. For me, it was AirPort Module. Sluggish? I think this is entirely due to the number of items in the catalogue database. If you have upwards of 100,000 items, searching it will be slow on slower machines! This was certainly my problem on my old Mac. Reducing number of files being scanned (e.g. omit Library folders!) made QS snappy again. super-powerful interface to control your computer. super-fast way to control and open files. Quicksilver, Sluggish and Out of Date. 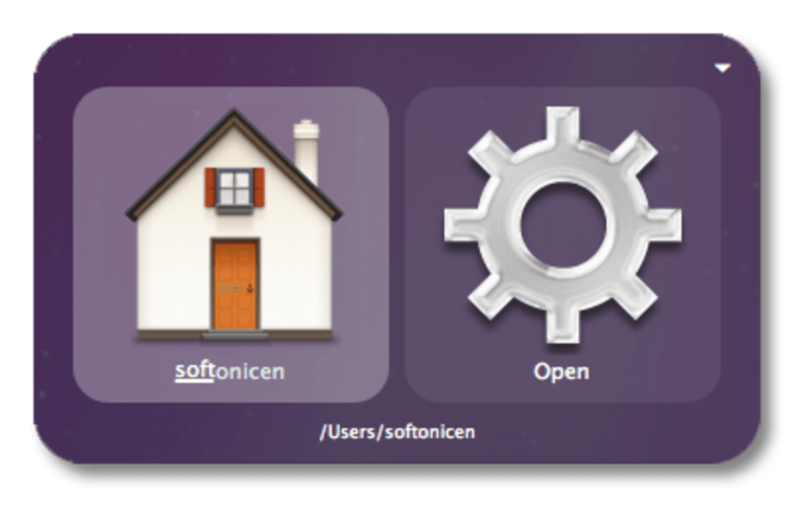 The current version works fine on OSX Snowleopard (10.6.5). Quicksilver used to be essential for me in using my Mac. Now it has become a reflex to invoke the QS bezel and launch apps or calculate numbers. But Quicksilver is less quick than it used to be. Sometimes when I launch multiple apps at once it misses an app or two. Everyday processes on my Mac can cause delay in responsiveness and I find myself often waiting for the bezel to appear after invoking it. There are many more things you can do with QS other than launching apps but you have to take the time to learn what it can do. Overall it's a great launcher that stays out of the way until you need it. But if you aren't already dependent on it, I'd suggest skipping this app. Unless the code is updated and optimized to be more responsive, and now that it's open source and hasn't been updated since Nov. 2009 I don't see that happening, it's not worth using anymore. Convenient, easy to use, stays out of the way. The current version at the time of writing is b58. It works quite nicely on Snow Leopard. A few of the less popular plugins still need to be updated, but otherwise all is well. Some users have reported on the Quicksilver discussion group that certain software download websites have been trying to charge for access to the latest versions of Quicksilver. Please know that this is a rip-off; anyone can get access to the latest version for free by going to the address posted above.